We’ve finally reached the proverbial end of the semester. Everything that you’ve worked toward, every paper written, every quiz taken, and every sentence read in your books has led to a series of exams that will make or break your success this Fall 2018 Semester. No pressure, right? The Final Push Of The School Year — You Got This! As much as you’re ready to bask in the glory of winter break complete with no worries and no studying to worry about, there’s one last academic push that you’ll have to make. Hopefully, you’ve had a restful and productive Thanksgiving break and you came back swinging during the short period of time between turkey break and the rest of the semester. At least it’ll be over soon! 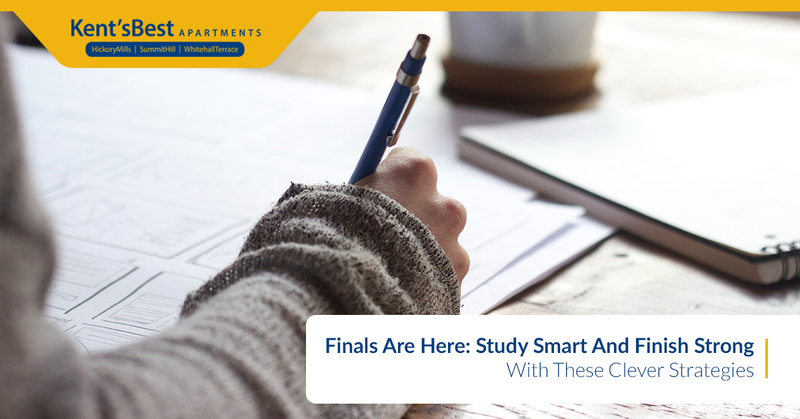 Kent’s Best Apartments, your source for conveniently located Kent apartments designed just for students like you, offers several effective studying strategies to help you effectively retain information, minimize stress, and ultimately, ace those exams. Let’s get started. Give yourself a bit of a “pre-test” before you spend multiple hours preparing for a specific exam. Seriously, by forcing your brain to rack itself for the answers — and even if the answers you come up with are completely wrong — this will give you a much better idea of what you have yet to learn and what you’ve already nailed down. Ideally, testing yourself beforehand will work to adjust your thinking in a way that’s more conducive to better absorbing the relevant information in front of you. Spending hours on hours studying with few breaks in between is only going to help you burn out prematurely. This is why procrastination is the devil when it comes to preparing for exams, as you’re not really giving yourself the proper amount of time to absorb and comprehend the material at hand. Neurobiology researchers at UC Irvine were able to discover that there’s a biological mechanism associated with enhancing the effect of “spaced studying or “spaced training.” Essentially, they found that your brain synapses will encore memories (or new information) in the hippocampus more efficiently when said memories are activated at one-hour intervals. So, if you’re looking for an excuse to take a break, you don’t have to make one: it’s science! A great way to ensure that you’re making the most of your study time is to have multiple spots around campus where you can focus without any distractions. It’s easy to find that one place that’s particularly comfortable and inviting, and for many students, that may very well be at Kent’s Best Apartments. As nice as it is to stay in and hit the books when it’s cold and uninviting outside, it’s recommended that you switch up where you’re studying. Why? Well, by changing your environment, your brain forces itself to retrieve the same information it’s been dealing with, but in a different place, and will therefore place more importance on that information because you’re consciously recalling it in different areas. Getting stuck on a particular concept or problem? All too often, college students tend to read over the same paragraph or sentence multiple times, confusing themselves even more. Take a step back, take a quick break, and return to the same subject matter by asking yourself questions about it. Reinforce your brain’s memories by testing them. They’ll become a lot stronger than if you just re-read something. Remember when we suggested to test yourself initially to get a better gauge of your understanding? Quizzing yourself periodically acts as a check-in to help hold your brain accountable. It’s well known that when actual teachers sit down and prepare their lesson for the next day, they seek out key points and organize information in a high-level manner that other people can better understand. Do this. If necessary, grab a friend or two and tell them what you know about the material. It will help your brain recall a lot of information. This is your final push (literally)! Thanks for stopping by our blog about our Kent apartments. If you have any questions about how Kent’s Best Apartments can help you, please contact us. ©2019 Kents Best Apartments | All rights reserved.